Acalypha indica is called Indian Aclypha with green unisexual flowers grown in tropical land to an height of 75 cm. It’s found mostly in India, Africa and Sri Lanka. Due to some special character it is said to be attracted by cat and so it's called as Poonamayakki in Tamil. It is used in Tamil Siddha medicine and it is believed to make our body ourselves feel fresh and better. In West Africa the leaves are cooked and eaten as a vegetable. 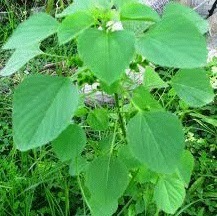 The paste acquired from the leaves of the Acalypha indica is helpful in curing burns. The juice extracted from the leaves, mixed with lime are applied on skin to cure diseases caused by Ringworm. Powdered leaves are used to cure infected wounds. The whole plant of this herb collected in its flowering stages and dried to make ingredient for the drugs Acalypha. It is useful in broncitis ,asthma, pneumonia and rheumatism. Fresh juice of leaves mixed with oil and salt is used to cure Scabies. The active medicinal compounds like Acalyphine, alkaloids, cyanogenic glucoside and Triacetoneamine are extracted from this plant.